At press time Tuesday night, incumbent Wilmington Mayor Bill Saffo won re-election in a landslide Tuesday for his sixth term, defeating challenger Todd Zola, 85 to 15%, becoming one of the longest serving mayors in the port city’s history. Meanwhile, for City Council, incumbent City Councilman Kevin O’Grady led all candidates in the nine-candidate race, followed by incumbent Councilman Charlie Rivenbark, and Rev. Clifford Barnett, pastor of Warner Temple AME Zion Church, edged out Deb. Hayes for the third open seat. Rev. Barnett replaces councilman Earl Sheridan, who chose not to run for re-election. Rev. Barnett, now the only African-American on the council after Sheridan leaves, said his win is a testament to the need for diversity on the council, and wants the city to be a better place for all of Wilmington’s citizens to live and work. One of his priorities is to advocate for affordable housing for those who work in the city. [RALEIGH] At press time Tuesday, incumbent Raleigh Mayor Nancy McFarlane, an independent, won a fourth-term to lead the Capital City in a runoff against hard-charging challenger Democrat Charles Francis, who had the support of Raleigh’s black community. McFarlane won 58 to 42%.. Mayor McFarlane said this coming term may be her last. In Durham, City Councilman Steve Schewel outpaced former City Councilman Farad Ali, 60 to 40%. Ali had the endorsement of outgoing Mayor Bill Bell, - who has served for the past 16 years - and the Durham Committee on the Affairs of Black People. In Charlotte, Councilwoman Vi Lyles, a Democrat, jumped out to an early lead over Republican Kenny Smith, and kept it to become the first African-American woman to be elected mayor of the Queen City. Lyles had a lion’s share of the vote, 58 to 42% percent. Congratulations to Rev. Clifford Barnett, pastor of Warner Temple AME Zion Church, for winning a seat on the Wilmington City Council Tuesday night, winning behind incumbents Councilmen Kevin O’Grady and Charles Rivenbark. Rev. Barnett now replaces Earl Sheridan as the only African-American on the City Council. Sheridan decided not to run for re-election after three terms. This was a tough one for us in Wilmington. Out of three black candidates running, Rev. Barnett came through. That means, in terms of representing the African-American community of Wilmington at the council table, Rev. Barnett is there as our voice. And one look at his community involvement, especially with the children of our community, tells you he is certainly up to the job. We might not agree with him on every issue, but we know his golden heart of service is in the right place. And it needs to be, and long before swearing in, the community needs to sit down with Rev. Barnett, and refresh him on our issues – economic development in the black community, affordable housing for low-income families in the face of increasing gentrification; the need for more African-American police officers, NOT, as we noted last week, more riot gear and military equipment. How can we get more black small businesses downtown where the money is being made, and how can those businesses get access to needed capital to succeed? Other cities right here in North Carolina have found the answers to those questions, why can’t Wilmington? Attracting more employers here so that more people can get jobs and work their way out of poverty…and YES, clean water. What can the city do to ensure that ALL residents of the port city have clean, unpolluted water to drink, cook and bathe in? We could go on. The bottom line is, our community MUST come together NOW, roll up our sleeves, and work hard towards making sure that our issues are addressed by Mayor Saffo and the entire new City Council. An ALL Democrat Council, by the way, so let’s see just how responsive they are. With three African-American candidates vying for three open seats in a nine-candidate race, the writing is on the wall. We have to learn how to poll our resources, and concentrate our votes to get the best representation possible for OUR interests. Because in the end, that’s what all of this is about…making sure that our interests as a community are heard, seriously considered, and answer as positively as possible. Rev. Barnett can’t do it alone, obviously. He has to bring a majority of the council around to his way of thinking, and from what we’ve seen, he has the respect of many. But that also means that WE, us, our community, can’t raise hell about an issue we want City Council to address, and then not show up in strong numbers to support our City Council representatives who are pleading our case. If we want progress, we have to support each other, for only then can we come together and advocate for what’s just and correct for our community. Congratulations,. Rev. Barnett, on your impressive win Tuesday. And now, community, the work really begins! A special master, designated by a federal three-judge panel, is currently tasked to review redrawn NC legislative maps in the Covington case to confirm if nine specific districts are legally problematic, and if so, redraw those so that the maps are constitutionally compliant by Friday, Dec. 1st. “I feel like we’re probably going to lose our case on redistricting. It doesn’t look good,” Rep. Bell, who represents Craven, Greene, Lenoir and Wayne counties, was recorded telling the attendees at the Lenoir-Wayne Republican Men’s Club GOP fundraiser at the Walnut Creek Country Club Oct. 24th. According to NC Policy Watch, a nonprofit progressive state news and commentary website, the NC Democratic Party released the audio of Bell’s remarks. He has not responded to press inquiries about them. “When you talk about corruption, let me tell you something; did you ever see the plaintiffs and the judges hanging out with each other?” Bell is heard asking his audience. And then Rep. Bell say something that many observers are already surmising – that the Republicans might sacrifice the 2018 mid-term elections, just to appeal what they already suspect will be a negative verdict to the US Supreme Court, where they feel, because of the 5-4 conservative slant, they would have a better chance to hold onto their legally problematic legislative districts. “I feel that they’ll actually, the Supreme Court, will agree with us,” Bell said. Rep. Bell’s alleged remarks are just the latest indication of Republican legislative leaders hitting the panic button over the federal court’s appointment of Stanford law Prof. Nathaniel Persily of California. Persily has previously served as a special master, and redrawn districts in New York, Maryland and Georgia. It is Persily’s job to correct the nine legislative districts – four Senate and five House – that the judicial panel has deemed to be legally problematic. The four Senate districts still reflect the racial gerrymandering evident in the original 2011 NC legislative redistricting maps rendered by the Republican-led NC General Assembly, and ruled unconstitutional by the US Supreme Court. The five House districts were redrawn by the legislature in September, but didn’t have to be because they weren’t racially gerrymandered. Since they weren’t part of the original 28 legislative districts under court order to be redrawn, then doing so was in violation of the state Constitution. Persily will now have to return those five House districts to their original boundaries. Through their attorney, Phil Strach, Republican leaders told the court in a motion that it was premature to appoint Persily to redraw anything before an official ruling is handed down on the previous version of the maps (they were deemed legally problematic, but not officially unconstitutional yet) before the GOP had yet a third chance to correct whatever mistakes they made the second time. With Dec. 1st the target date for Prof. Persily to deliver new maps, it is apparent that the three-judge federal panel wants to get them into the hands of both the plaintiff and defendant’s attorneys for review and comment no later than January, and use whatever time is needed prior to the February filing date for legislative primary candidates to begin filing for office, to finalize the maps. The expected monkey wrench from the Republicans is that they will immediately appeal to the US Supreme Court, which, given past experience, would take it’s time to render a decision, thus pushing the May primaries back, if not the 2018 fall general elections. One thing is certain, political observers agree, is that North Carolina Republicans do not want to lose the current electoral advantage that the 2011 legislative maps gave them, and would rather delay the 2018 elections until they got a favorable US High Court ruling, as state House Majority Leader Bell said, than try to compete with objectively drawn voting districts that the special master is likely to produce. Keeping yet another campaign promise from his 2016 candidacy, Gov. Roy Cooper last week issued and signed Executive Order #25 “…to create jobs and expand economic opportunity for historically underutilized businesses in North Carolina. The governor also used the Nov. 2nd occasion to announce members of his new Governor’s Advisory Council on Historically Underutilized Businesses, with appointments from the Triangle to the Piedmont, and beyond. Gov. 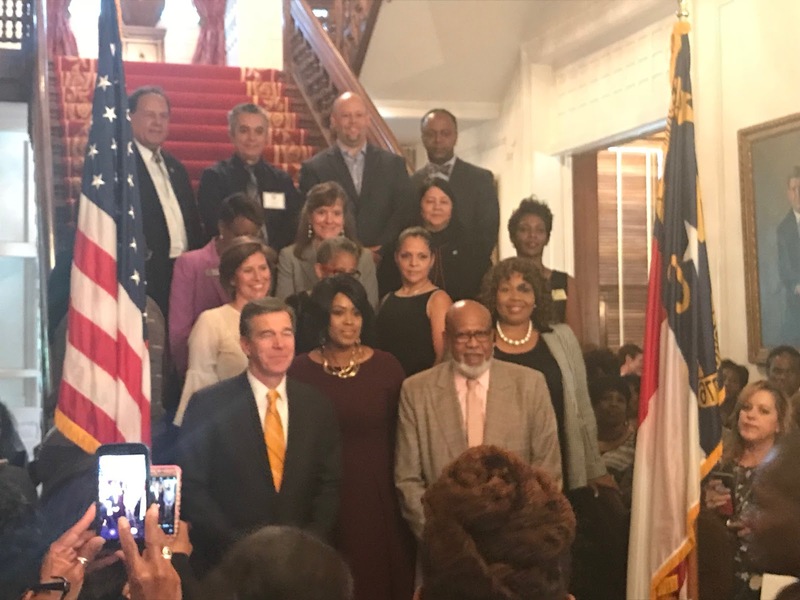 Cooper had proclaimed October, “Minority Enterprise Development Month,” paying tribute to businesses, corporations and financial institutions owned and operated by people of color and women statewide, for their contributions and achievements in the face of daunting odds and barriers. According to the US Dept. of Commerce’s Minority Business Development Agency, there are approximately 183,000 businesses owned and operated by people of color and women across North Carolina. They account for over $16.1 billion in sales revenue, and employ over 129,000 North Carolinians annually. In turn, the NC Dept. of Administration’s Office of Historically Underutilized Businesses is the agency that seeks out and promotes black, women-owned and other businesses of color in the state, to business with state government in terms of procurement of goods and services. The “HUB” Office, as it’s commonly known, works to make sure that qualifying businesses meet state requirements to contract with state agencies for a variety of needs. “Investing in the growth and development of small and minority owned businesses creates opportunities for individuals to improve their quality of life and the communities where they live,” Secretary Machelle Sanders said. “I have directed the HUB Office team to explore new and improved ways to deliver effective and efficient services that will spur economic growth. Most importantly, we will foster meaningful and substantive inclusion of historically underutilized business across North Carolina to strengthen our state." Per the Governor’s Advisory Council on Historically Underutilized Businesses, among the 21-members appointed by Cooper were Cornelius Lambert of Greensboro, the former owner and Executive Vice President of CoMor Corporation, an IT and computer networking firm, and a Board Member for the Greensboro Chamber of Commerce; Ms. Iris Reese of Durham, the president of Fusion Multicultural Marketing; and Andrea Harris of Raleigh, the founder of, and a Senior Fellow at the Institute of Minority Economic Development. At the age of 23, Harris became the executive director of a community organizing group in Henderson, and she was the youngest community action agency director in the nation at the time.